Blog post by John Sterman, MIT Sloan School of Management, Cambridge, MA, April 25, 2016. On Friday, April 22, 175 countries signed the historic Paris Climate Agreement. Problem solved, right? Make no mistake—the Paris agreement is historic. We all know that politics is the art of the possible. Getting nearly 200 nations to agree on anything is extraordinarily difficult. Yet nearly every nation on Earth came together and agreed to the most serious efforts to date to reduce the risks of climate catastrophe. Remarkably, the Paris agreement achieved what was politically possible, and perhaps even a bit more. We should celebrate that accomplishment. And yet…the Paris agreement is also grossly inadequate. Scientists, policymakers and UNFCCC diplomats, including Executive Secretary Christiana Figueres, know that the Paris pledges, even if fully implemented, won’t be enough and won’t be in time. The MIT/Climate Interactive analysis shows that full implementation of the Paris pledges would lead to warming of about 3.5°C (6.3°F) above preindustrial levels by 2100, about 1°C (1.8°F) less than business as usual. That is progress, but it is not enough. The Paris agreement itself recognizes these facts. It “notes with concern” that “much greater emissions reduction efforts will be required” between now and 2030, with even deeper cuts after that. Why? Think of the atmosphere as a giant bathtub. 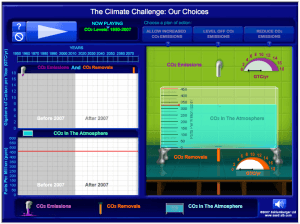 Test your understanding of the carbon bathtub with our simulation. To do so the UNFCCC should focus its efforts on strengthening the pledges for emissions cuts of the parties through the global “stock take” provision in paragraph 20 of the agreement. Cutting GHG emissions enough to have any decent chance at limiting warming to 2° requires cuts from essentially all parties, both the developed and developing world. 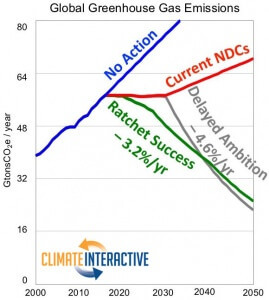 The developed nations must increase the ambition of their NDCs with earlier and larger cuts between now and 2030. For example, the US, whose pledge only specifies a target through 2025, must provide an emissions reduction target for 2030 and that target must provide for deeper and earlier cuts between now and then. And that is not enough. Many developing nations continue to argue that the developed nations created the climate crisis and therefore bear historical responsibility to solve it by cutting their emissions, while the developing nations must continue to burn fossil fuels. Greenhouse gas emissions for several scenarios with required annual emissions reduction rates. Toward that goal, the Paris agreement reaffirmed the target of $100 billion per year in financial assistance by 2020 for the developing world. However, commitments toward the fund fall far short, and $100 billion per year may not be enough given the scale and speed of the transformation required. $100 billion per year sounds like a lot of money, but it is a tiny fraction of global GDP and far, far smaller than the likely costs of the damage to the economies of the developed and developing nations likely to arise from continued use of fossil fuels. A few basis points of global output is a small price to pay to reduce the risks of climate catastrophe. It is the cheapest insurance the world can buy. So, yes, politics is the art of the possible. But physics takes no notice of politics. Our task now, the task of people around the world, is to expand what is possible through grass-roots support for bolder action, so our political leaders will have the mandate to commit to deeper and earlier emissions cuts, and to implement the policies needed to achieve them. Success will come only if we get involved. Join any of the groups working to cut emissions, create jobs, and build a sustainable economy, from the progressive 350.org, to the nonpartisan Citizens Climate Lobby, Environmental Entrepreneurs and Mothers Out Front, to the conservative RepublicEn and ConservAmerica. If our leaders won’t act, we must elect new leaders who will. We can do it. We’ve done harder things before. But we must act, now. Nothing less will protect our common future. 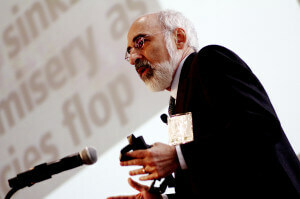 John Sterman is the Jay W. Forrester Professor of Management at the MIT Sloan School of Management and faculty director of the MIT Sloan Sustainability Initiative.